The layered landscape emerging in springtime. This includes all the tall canopy trees – shade trees and evergreen trees, such as oak, maple, ash, birch, and beech as well as pine, spruce and hemlock. To see these majestic creatures and really take them in, you have to make an effort to really look UP. They start at about 40 feet tall (the height of a utility pole) and just keep going up! We are generally not the architects of these plantings. Instead, we often inherit this level from a previous generation, or they are of an older woodland. This is a PROFESSIONALS ONLY workspace. You want to engage a certified arborist when working in this space. It is VERY DANGEROUS, and the trained professionals know this. Do not use unskilled labor for this work. Quick story – a neighbor of mine (a great guy, mind you) thought it would be a good idea to have some of the kids from the local agricultural school help him with some tree removal. After all, they were going to school for it, right? What could be the harm? It would be a great hands-on experience. That morning, my husband and I – at separate times in different cars – drove by and saw this work in progress. Horrified, we immediately called/texted each other about what we saw. We wrestled with our consciences – should we go tell them to stop? Once we were both home and before we could make a decision, our power went out. We looked at each other in horror and ran outside. The tree they were removing didn’t fall in the direction they planned. Instead, the tree twisted and fell on the wires close to a utility pole in front of our neighbor’s property. The tree pulled the wires, taking out that pole and another one, along with the power for our neighborhood. Fortunately, no one was hurt. So that was a GOOD story of a well-meaning, kind man, giving some work to eager young workers with some training but NO understanding of the huge public and personal safety responsibility involved in this work. This encompasses a wide variety of ornamental trees, including flower and fruit-bearing trees. Also any young shade or evergreen trees that are less than 40 feet tall. These trees may still require a little looking up, but they are more integrated with the visual interest of your property. 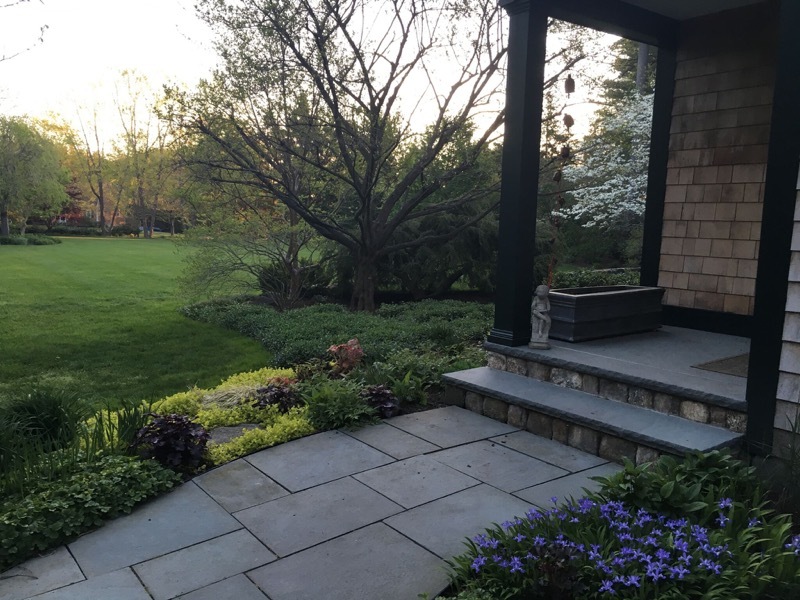 Coveted flowering trees such as dogwoods, crabapples, cherry, pear, and stewartia remain in this category for their entire lives and become visual anchors or focal points in the landscape. Many evergreens such as arborvitae, cedars, and cypress also fill this niche as hedges or year-round greenery. These plants generally fill the gap between about 15 feet up to where the sky niche plants take over. These plants may be used as individuals, small groves or long hedges. It is my opinion that this too is a PROFESSIONALS ONLY workspace; however, I have met avid and well-trained gardeners who can and do manage to take very good care of plants in this realm. What is unique about these people is that they are indeed very careful and take safety into account before work. They also take great care to consider the health and well-being of the plants. If that’s you, this can be a fun place to learn and grow as a gardener. All the shrubs you could possibly think of fall into this category, from the big guys such as lilacs, viburnums, and witch hazels; to the mid-range broad-leafed evergreens such as rhododendrons and mountain laurels; to the lower levels of azaleas, hydrangea, and roses. This is a huge category that also includes many compact and dwarf varieties of understory-sized parents. These are many of the eye-level plants that we see every day coming and going and whenever we stroll or sit in the landscape. We ask a lot of these plants. One of the big asks is that they stay small. These are the plants most at risk of being butchered and sheared to death by our need to keep them static and small. Take stock of this layer and determine the best ways to care for it so that the plants stay both healthy and vibrant while also pleasing to your eye and well-balanced in the landscape. Sometimes, these are the plants best-suited for transplanting to new locations when they get too big. Or they’re the plants we remove so we can start over. This layer is best served by the expert pruning skills of both the professional and experienced amateur gardener. I’ve met many homeowners keen on learning how to prune well and just as many so-called landscapers who haven’t a clue. Success in this niche is had by knowing the different needs of different plants to ensure wise care and cutting decisions are determined by the plant’s horticultural characteristics rather than just on size and shape. All the low shrubs, perennials, and ground covers fall into this category. It is both diverse in plant type as well as characteristics. This is the layer that is most mutable as you can create and recreate perennial gardens, ground cover beds, and lawn areas over and over during a gardening lifetime. This layer is the most dynamic and the most forgiving and is truly the playground of gardeners of all skill levels. A daylily will certainly benefit from a skilled hand, but it will also forgive the clumsy hands of a first-time gardener. This niche changes constantly throughout the year. While the middle-story niche has a season of flowering and color, the ground niche is always changing, and surprises are always afoot when diverse combinations of plants are used together to create a colorful and textural dance through the seasons. We don’t see this one, and hardly even stop to consider it, but it is a vast microcosm of activity just beneath our feet. There are layers even within this niche of plant structures and active live biological activity. Beneath your feet and below your landscape plants there is a whole other world that cannot be forgotten or discounted. The layers and interaction of root systems dictate the availability of water and nutrients as well as the stability and survivability of plants. Overcrowding beneath the surface creates the same struggles as above the surface. Tread lightly and consciously on this hidden and precious layer. The soil niche is ancient and powerful and easily destroyed by heavy equipment, cars, chemicals and relentless foot traffic. While this niche is accessible, it is so technical with physical, chemical and biological aspects that anything done on or to the soil needs to have a basis for doing it. Things like soil analysis and testing and/or assessments to understand the scientific characteristics. This means that partnering with a landscape professional trained in soil management can be really useful when tackling any big problems like drainage and compaction. The five niches I’ve described here cover the astonishing array of ecosystems, plants, and elements (visual and structural) that make up our landscapes. By being conscious of them and carefully considering them individually and collectively, you can assess your landscape and its needs with confidence.